Hello my lovely readers, I'm starting a new series back on this blog: 'Why You Should Watch..' A series where I talk about films I think you should watch at least once in your life for whatever reason, their message, their acting, their story, etc. The first film I'm going to write about is Grave of the Fireflies. There are certain films in the world that you have to watch, at least once in your life. 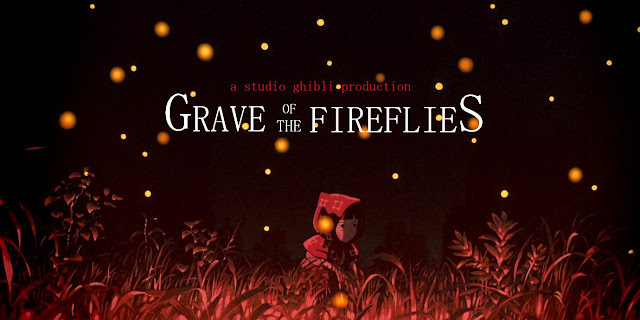 Grave of the Fireflies is not just one of those films but is around the top of that list. Grave of the Fireflies is a Japanese animated film from Studio Ghibli. It was released in 1988 alongside My Neighbour Totoro and though it wasn't directed by Hayao Miyazaki it doesn't make it any less of a masterpiece. The film follows two siblings, Seita and Setsuko who lose their mother and home in the fire bombings of Japan during of WWII. They try to survive through the bombings and malnutrition, SPOILER ALERT: both children die. Although this is shown at the beginning of the film so it's not really a spoiler as it's Seita's spirit who takes you the story. So why should you watch it? Though the director has said the film isn't an anti-war film I highly doubt anyone who watches this film will agree with war being a good thing. The film shows the despair, destruction, grief and pain caused by war. It displays the horrible side of human nature and how war can bring that side of many people to the surface. Grave of the Fireflies doesn't do what you may expect: depicting the allies who are bombing Japan as evil and the Japanese as brave, innocent victims. Instead the film shows individuals, some who are kind (the policeman) and those who are cruel and selfish (the aunt). It also shows the failure of society and how it's exclusion of certain people has horrific outcomes. I won't lie to you and say that the film isn't depressing and heartbreaking. I feel myself almost snapping each time I watch it but it's why you should watch it. It's one of those films that shakes you to the core and you aren't the same as you were before you watched it. As sad and upsetting as the film is there are brief, glittering moments of happiness between Seita and Setsuko. 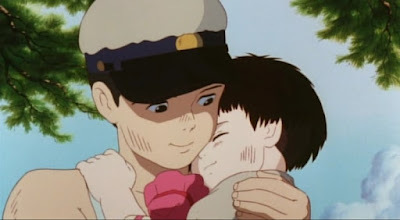 The love the two characters have for each other is so beautiful, Seita does all he can for Setsuko. Despite all the horrors that are happening all around them and Setseuko being at a difficult age. He never gives up on her and when he loses her it's truly heartbreaking. Though the film was released in 1988 Grave of the Fireflies is still a relevant film. Especially with all the wars that are still happening today and the terrible things that happen to Seita and Setsuko are happening to children all over the world. I hope you enjoyed reading this post. Have you ever watched Grave of the Fireflies? What films do you think you should watch at least once in your life? Wow this sounds amazing I've never heard of it, I'm quite new to Anime and still need to watch My Neighbour Totoro so once I've watched that I'll watch this, thanks for the recommendation. I recommend almost all of the Studio Ghibli films they are amazing anime films. I hope you enjoy, thanks for stopping by! This was the very first Studio Ghibli film that I discovered, and I fell in love. It's such a heartbreaking story but I watched it so many times! It's such a masterpiece isn't it? Thanks for popping by!